While most of the young people attending AdFest will be partying in the evenings, there will be some working through the night. They will be the participants in this year’s Young Lotus Workshop. As in previous festivals, participating teams from the ad agencies will compete to produce create solutions over the two and half day workshop. The best ideas will be shown on the last night of the Festival. The delegates will also have the opportunity to determine the Young Lotus ‘Popular Vote’ winner. 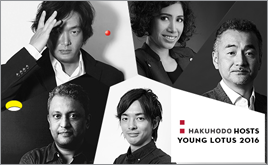 This year the Young Lotus Workshop will be hosted by Hakuhodo Inc. with Kentaro Kimura, Co-CEO and Executive Creative Director of Hakuhodo Kettle, will chair the workshop. The theme is ‘You can leap higher than you think: 5 ways to create innovative ideas’. Kimura will first explain to the participant how his agency makes creative leaps by 5 fundamental Creative Alchemy skills and the teams will use this to create solutions. AdFest 2016 runs over four days from 16th to 19th March at the Royal Cliff Hotel in Pattaya, Thailand. Go to www.ADFEST.com for the programme and to book.